TARRC's former Deputy Director of Research, Dr Alan Roberts, has just won two awards in as many months. Firstly, on the 4th March 2014 at the Malaysian Rubber Board's Innovation Award Dinner held at the Dewan Perdana Felda, Kuala Lumpur, Dr Roberts was given The Special Award, a new award introduced this year to give recognition to personalities that have contributed significantly to the rubber industry. The Special Award was given to Dr Roberts for his contribution to research on physics of natural rubber for more than 40 years. A presentation was made at TARRC by Dr Kamarudin Ab-Malek, TARRC's CEO, to Dr Roberts who was unable to attend the Dinner in Kuala Lumpur. Dr Roberts has also been awarded The Charles Goodyear Medal at the 185th Technical Meeting of the Rubber Division, American Chemical Society by Doug Ruch, Rubber Division Chair-Elect, held at the Hyatt Regency in Louisville, KY., 24th-26th March 2014. Gretchen Spear, Marketing Manager at the Rubber Division, ACS said, 'The Rubber Division, ACS was proud to award Dr Alan D. Roberts our highest honor, the Charles Goodyear Medal. His cutting edge work on the chemistry and physics of interfaces, which so impact our daily life, is very deserving of such an honor. His contributions to our great industry are to be commended'. 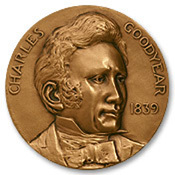 The most prestigious award given by Rubber Division, ACS, was established in 1941 to perpetuate the memory of Charles Goodyear as the discoverer of the vulcanisation of rubber, by honoring individuals for outstanding invention, innovation, or development, which has resulted in a significant change or contribution to the nature of the rubber industry. This award is supported solely by Rubber Division, ACS. For more information on the Rubber Division please visit their official website www.rubber.org.